Overnight, the forecasters called for frost. They were referring to the outdoors but might have included the indoors too: Greaves House B&B had all the right amenities except that the central heating was feeble on a cold night. Each B&B has its own surprises, which can be charming or exasperating depending what they are. I didn't see any frost outdoors today, but it was certainly cool, and it felt more so because it was breezy, with the wind at my back in the morning and battering my front in the afternoon. Back in Telford about ten days ago, cobbler John Cartright advised me that it wasn't possible to rescue my boots from an early demise as the heels wore down. 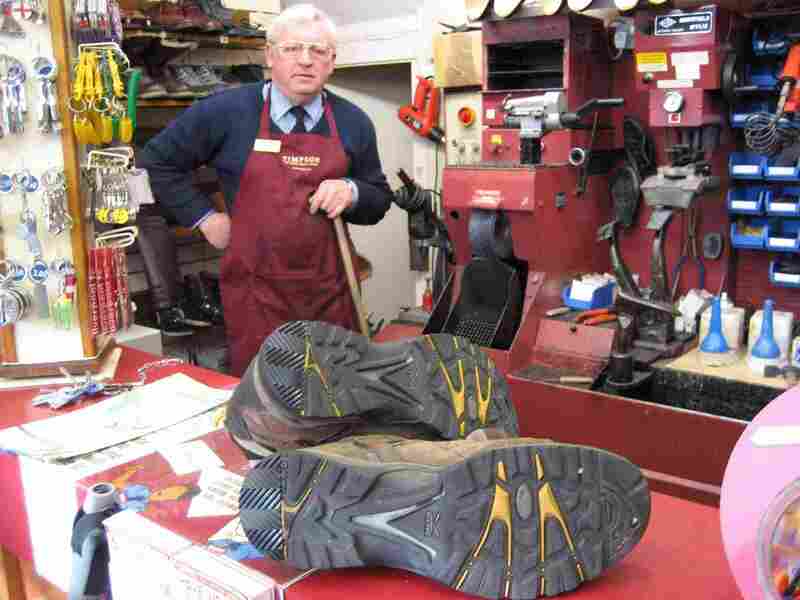 But today, with the rubber heel down to absolute skinny-minimums, I consulted cobbler Walter Duckett in Lancaster. Walter bonded some new heels to the boots in about 15 minutes, and wasn't at all concerned about them coming off. He was right, too. In any case, there was nothing to lose as the boots weren't going to last any longer. The new heels remained securely attached at the end of the day, though I think the new profile changed my gait enough to cause a flare-up of some old blisters. As far as blisters, I would have risked more with new boots. Lancaster seemed a nice enough old city and university town, though the university is campus-based south of town so that the city mainly houses students not living in dorms. The center of town seemed to have a plethora of take-out restaurants because of the students. As a city, Lancaster seemed comfortable but it did not make my must-return list. On the north side of Lancaster, as one crosses the River Lune, a one-way system separates the north- and south-bound A6 traffic, and takes each over its own bridge. My maps enabled me to ignore the road signs which would have given me a longer route on the northbound road, and instead take the southbound road to the north. In Bolton-le-Sands, I departed the A6, and had a most pleasant few miles on lanes and trails. From the hills here, I got a view of Morecambe Bay, known for its tides and the resulting expansive and treacherous mudflats at low tide. The tide comes in faster than one can run to safety, and people caught on the mudflats have drowned. Later I reached the A6 again, in the vicinity of Carnforth, and crossed the Lancaster canal as I did so. Here I saw a dog off its leash go after a cyclist, repeatedly yapping at the bike wheels until the biker stopped and pleaded to the dog owners for help. The dog was admonished and then leashed, but let off the leash a minute or two later - whereupon he took off after the cyclist again. It's difficult to look kindly on dog owners like this. Clearly Fido's feelings were of more concern than were the cyclist's. I wondered whether Fido would go after me also, with my walking stick, but he seemed to prefer bike spokes, and perhaps he recognized my stick as a defensive weapon. After passing Carnforth, I came across a rabbit in a blanket on the footpath. This touched a nerve. Many years ago, I rescued a bunny from certain death in a parking lot far from his mother or his habitat. Just three inches long, I managed to feed him from a dropper and then a bottle and then my hand. Against all odds, Douglas survived, and became larger than any decent rabbit had a right to be. Semi-wild, he lived in our backyard and was there to greet me after work. With time, he grew wilder, and acknowledged my presence only when my back was turned. If I sat in a webbed chair, he occasionally showed affection (well, I'll call it that) by approaching me from the rear and nipping my backside. He coexisted with our cat who quickly learned he couldn't catch him; Douglas was able to jump into the air and change direction at the same time, a maneuver impossible in Newtonian mechanics. Unfortunately, Douglas died, possibly of sickness, possibly of cold since he never learned to burrow (though that seemed not that essential in warm Southern California where we lived at the time). Then, here in Carnforth, there was another rabbit, and he looked just like Douglas. Perhaps he had been bashed by a car, perhaps he was an abandoned pet. Regardless, someone had left him sitting wrapped in a pretty, pink blanket on the country footpath, where he died within a foot or two of the hedgerow where rabbits live. Now drying out, he still seemed to be looking out at that hedgerow, as an old man might sit on a porch overlooking the playground of his youth. I left him there, but wondered later whether I should have buried him. And yet the rabbit in a blanket spoke of someone's love and care more than any grave would. From Lancaster, my next major destination was Kendal, a town that is one of the jumping-off points to visit the Lake District, a region deservedly-renowned for its lakes, trails and mountains, interspersed with stone-cottages and village pubs with fireplaces - as well as hordes of tourists in summer. Now a British pub is incomparably the best place to spend an evening if the surroundings are right and it’s a good one. Ideally, you’ll find the pub down a gravel drive and beside a river. It will have a thatched roof, and a sign that says something like Jolly Sailor or Fox and Hounds, or The Old Mill or The White Swan. Or nautical like The Square Rigger. Or unimaginatively military like The Victory or the Duke of Wellington. Or just plain curious, like The Bent Dog or The Gribble Inn. Its old wood entry door will be worn away at its bottom corners, as will the stone entry hearth but at its middle. The door will have a latch that you have to struggle with – not too hard, but enough to remind you not to rush because you may have to stoop to get through the door and into the low-ceiling, stone-floored, wood-beamed lounge that lies beyond. Once inside, you’ll find a roaring fire on your right, the bar ahead of you, and some local patrons to your left. There’ll still be two seats available next to the fire, one for your blond companion and one for you when you’ve been to the bar to get the drinks. As you’ve already deduced, my wife and I spent much of our courting days at pubs. The publican leaning over the bar will have the knack of welcoming you with just a touch of deference, a seemly amount of companionship, and the amazing art of knowing that you’ll want to know the cricket score and then tell him what you think of it. You’ll carry back a ginger or elderberry wine to your companion, while you can’t wait to break the froth on your pint of draft bitter. A “pint”, I might add, is a measure that in other contexts disappeared from the British way of life with metrication and the arrival of the liter (sorry, litre). If I understand it correctly, the pint was retained as a measure just for beer, as a matter of heritage, and you’ll find the glass or mug in which it is served has an official line on it that defines that exact amount. If it’s a sunny day, the pub will have a beer garden, with decent tables, not too sticky from previous beer spillage, overlooking the river. The river will have yachts at their moorings, especially if it’s close to the sea. If not, it will have grassy banks, swans and ducks in the water, and an element of excitement, such as a weir, or mill, or whirlpool. The garden may have a children’s playground, turning pubs into a family destination when the weather is good. There’s even a chance of a tame animal or two, like an invariably-old pub cat or dog. The beer garden will be as agreeable in summer as the fireplace in the lounge when it’s cold or raining. There’s many a time I have warmed frozen fingers at these fires, and later dozed in a nearby chair. As you read this, smoking has been prohibited in public places in Britain, which is about the best thing that can happen to pubs in my opinion. The amazing thing about pubs like these is how easy it is to find one with most of these attributes. With the possible exception of the thatched roof and the river, there is probably one such pub within three miles of any point in the nation. They are harder to find in cities, where rebuilding over the years has replaced them with newer, usually larger establishments. 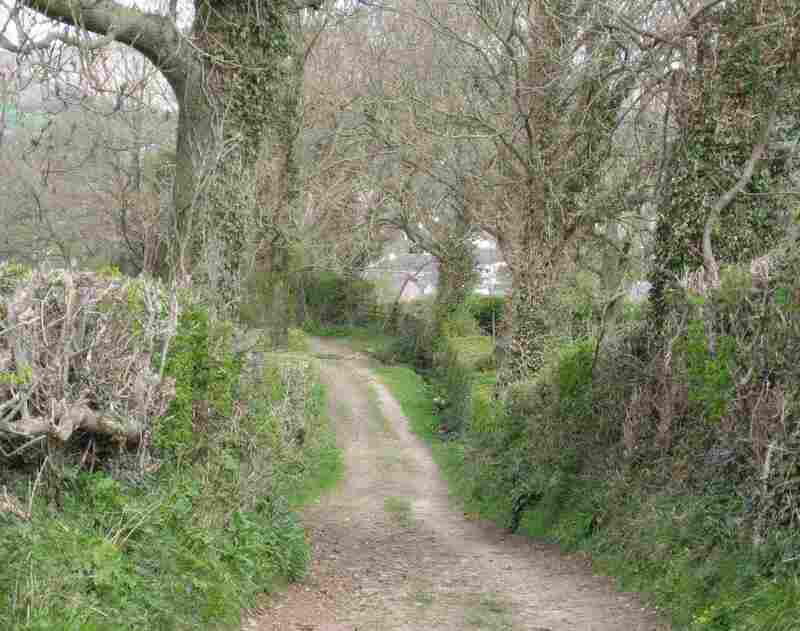 But, in the country, assuming you have a car or good walking instincts, you’ll find one within easy enough reach. As I revisited these pubs, after my several-decades absence from them, I found few changes. One is that a pint of beer now costs about 30 times what it used to cost, much of it due to inflation. As an impecunious American-hiker, this usually made me turn down a second pint of beer. I am not sure, though, that inflation is the sole cause of current prices. I’m told that the police rightly clamped down on drunk driving by tackling it at its source, which invariably meant staking out pub parking areas at closing time, raking in a rich harvest of drunks for any enterprising Bobby. This must have meritoriously cut down on the number of cars in ditches on the way home, not to mention injuries. The side effect of less drinking probably raised the prices at all pubs, and closed a few as well. It also spurred the tendency for pubs to offer food as well as drinks, which is a welcome development too. Some restaurants in pubs are pretty good and some are even award-winning - and most of the rest are at least decent. You can still get a “ploughman’s lunch” in British pubs – a hearty chunk of local cheese and rustic bread, with a pickled onion on the side. You may judge me to have either discriminating or over-demanding tastes, but I want to describe how the lounge and other indoor areas can come in various grades. I have already alluded to a fireplace and a low ceiling, both of which warm the soul if not the body as well. I don’t, however, like a billiards table, which seems to pull in the wrong crowd. I can put up with a darts board as long as it’s distant from me, so that the darts don’t bounce off the board and into my lap. And I positively like a pewter spittoon, because it tells me that there are locals, and old-timers at that. Chatting to locals in a pub is usually a great pleasure, though it may take some patience to become accepted. The bar itself will have brass or wrought-iron accents, and a well-lit line of draft beer faceplates at the pump levers. The walls of the pub may have pictures of hunting scenes, old maps, and the like – but these only impress if they are thoroughly aged and preferably stained. As for age, 15th-century pubs exist, and 16th to 18th-century ones are almost common, though in all cases they’ve been added to or modernized. Most locals will know of one such pub, and may even know of one nearby that’s been built out from a cliff face, or that’s been converted from a coach house or that Bonnie Prince Charlie stayed at - and he stayed at many, which is why I think of him now. If you know of Bonnie Prince Charlie only as a name (his full name, of course, being Charles Edward Lewis John Philip Casimir Sylvester Maria Stuart), you may want to read more about his remarkable and swashbuckling - and tragic - life. He was born in Rome into the exiled Stuart dynasty and influenced by his father to dream of seizing back the Scottish and English thrones for the Stuarts - Catholics whose leader King James II was deposed by the Protestant Dutchman William of Orange and replaced on the throne by William and Mary. In 1744, Charlie sailed for Scotland in two men-of-war, failing to meet up with a supposedly-allied French fleet that was arranged to accompany him but never actually set out. In 1745, he nevertheless landed in Scotland with but a dozen supporters, yet managed to draw thousands of allies to his side and march on London as far as the English Midlands. But the English were content with King George II, and repulsed him and eventually slaughtered the Scots at the Battle of Culloden Moor, putting a large bounty on fleeing Charlie's head. Over the sea to Skye." Exiled to France, he wandered Europe, but died in Rome as a drunk, and was buried in the Vatican. For all this, his life has been romanticized, and his image remains that of a Scottish hero. When modern-day Prince Charles becomes King Charles III, he might well have been Charles IV if Bonnie Prince Charlie had been King Charles III instead of "The Young Pretender". I passed many wonderful pubs while hiking, and went into some for a quick beer or a lunch. But when I returned home, I wished I’d visited more of them. They remain a focus of British social life, are significant features of the country’s architectural heritage, and are just plain fun to hang out at and read or chat. There are few pubs in North America that come close to rivaling the authenticity or ambiance of an old British pub. Also, the British are somehow trained in their use, part of the décor so-to-speak. But, downing my beer, it was back to hiking. Lancaster to Kendal is rather more than a day's hike. Here, as I approached the very north of England, I was in a rural landscape like Cornwall's. There isn't any substantial town before Kendal. Fearing a night in a ditch, which is my habitual nightmare, I tried to book a place in Holme, but couldn't make contact with the B&B. So I set my sights on Milnthorpe, the best-located village of any size. Then I got lucky: in the lovely village of Beetham (pronounced beeth-em, not beet-hem), just inside the county of Cumbria, I found Bluebell Cottage, owned and run by June Whitehead. It's a truly superior place, and she's the nicest hostess. I was sure I'd conclude next day that it's a place to come back to with Jenny. My quarters had ample space and heat, were beautifully furnished, and there was even a private patio on a terrace overlooking Mrs. Whitehead's flowers and a meadow with sheep, with hills on the horizon. They were, of course, the hills that lay ahead for me.